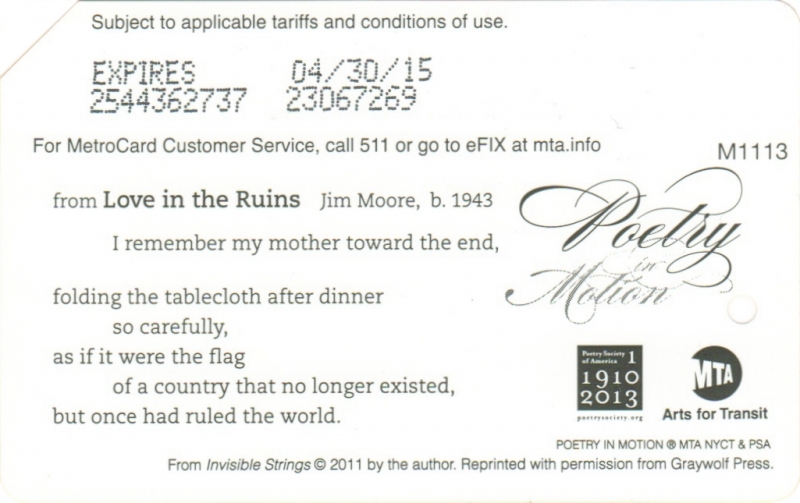 You are currently browsing the archive for the 2012 category. 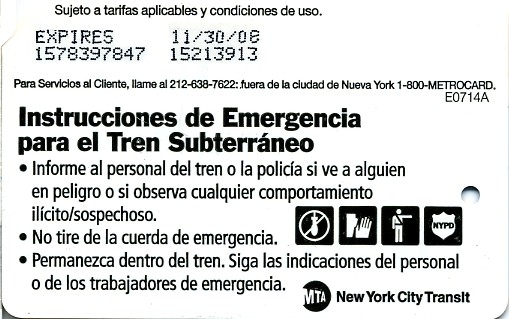 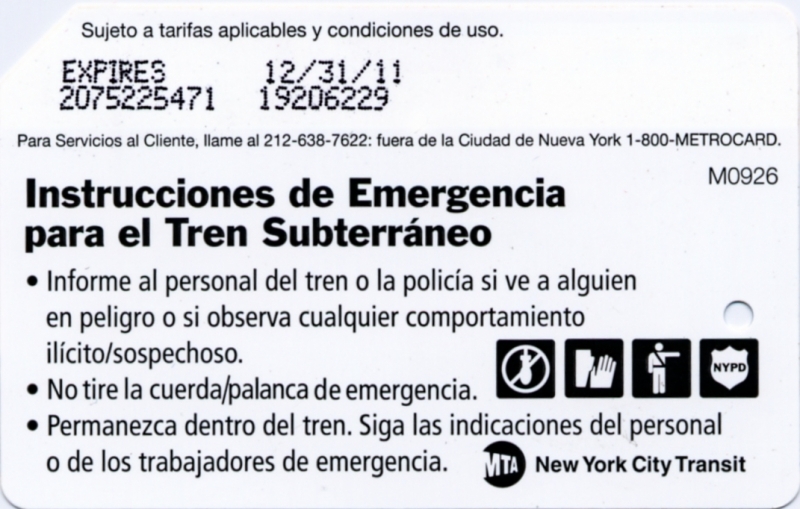 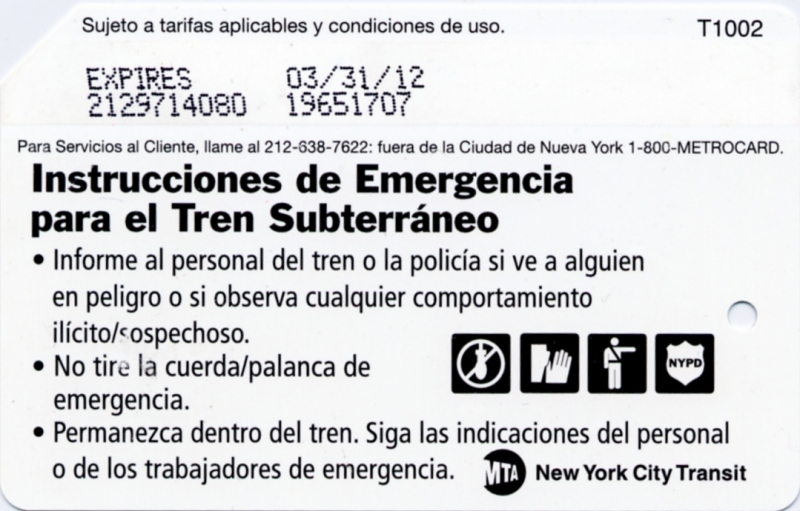 This set contains of 2 metrocards one in English and another in Spanish. 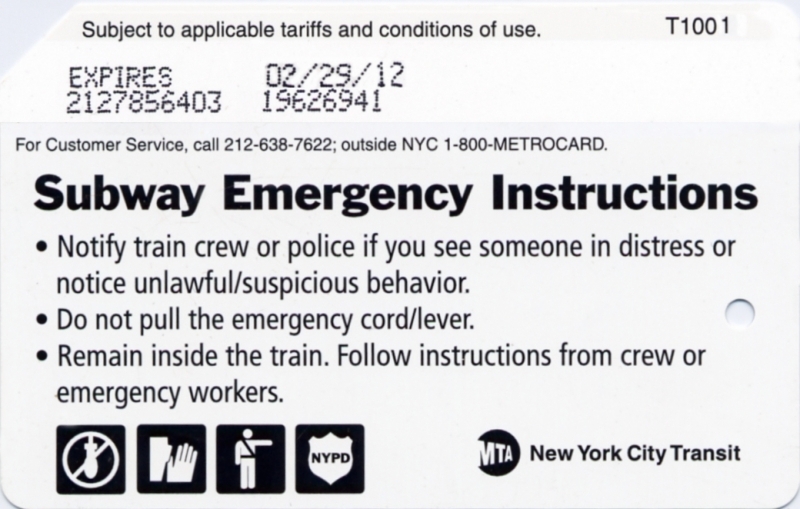 These cards were re-issued almost every year with variations of fonts, logos and text of instructions. 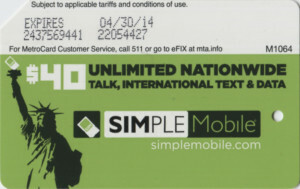 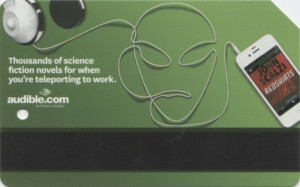 Another phone company advertises on metrocards: SimpleMobile chaep phone service. 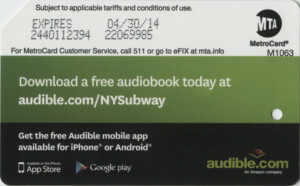 Another double side advertisement on metrocards sponsored by audible.com. 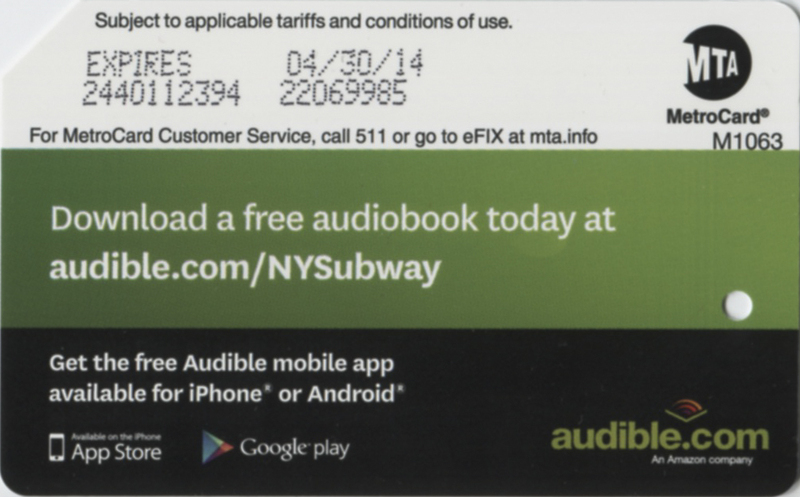 There is also promo code to get one free download from that web site. MTA is slowly moving into digital age. This card represents possibility for passengers to send SMS with their location (intersection) or bus stop ID printed on bus schedule to 511123 number to get time of arrival of next bus. 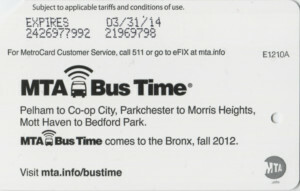 This service first was introduced in the Bronx. 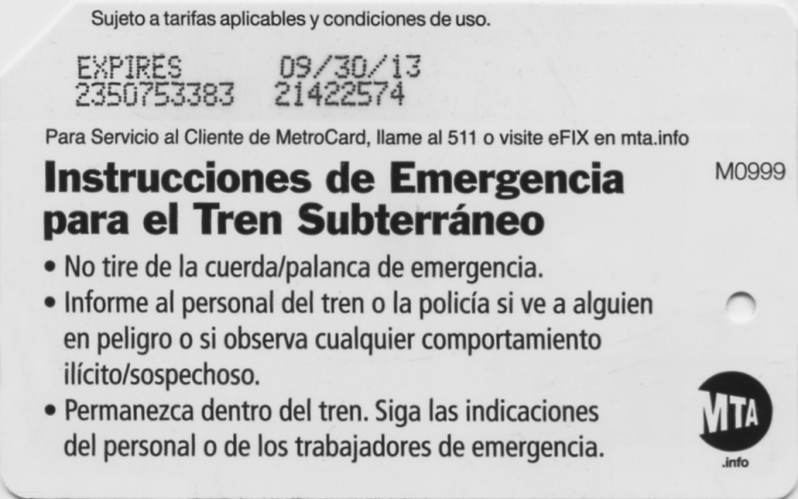 There are 2 versions: English and Spanish. 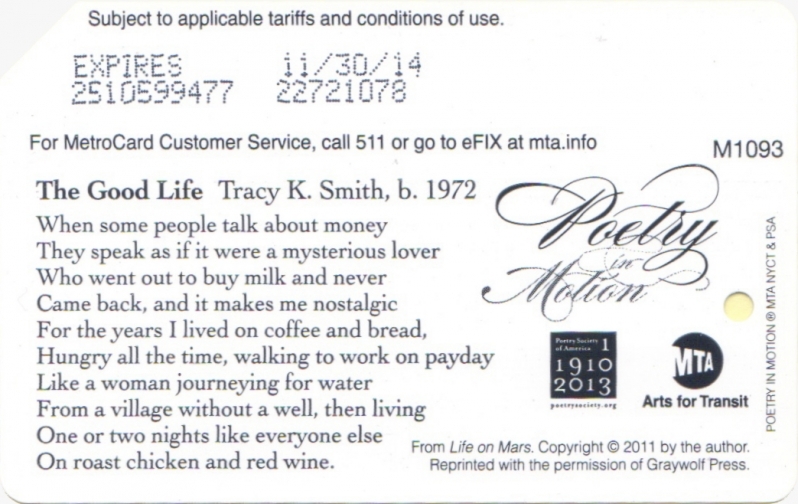 This is the first ever metrocard with advertisement on both sides. 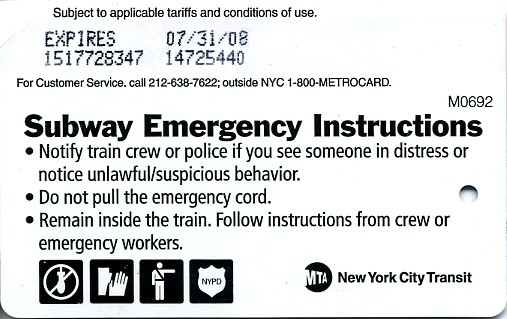 This particular card has created lots of confusions because magnetic strip was not visible well enough as on regular metrocards. 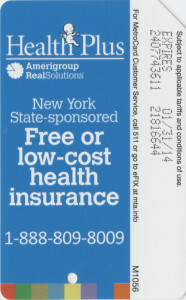 Advertisement for low cost health insurance – HealthPlus. 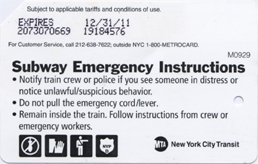 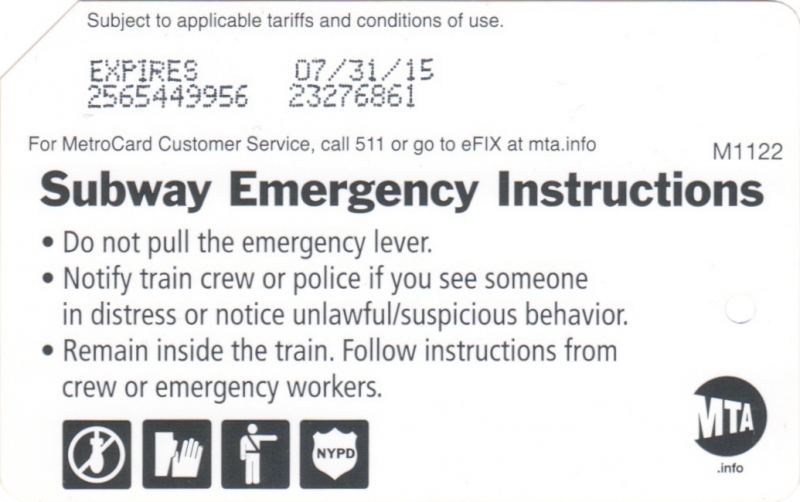 Metrocard was distributed on subway stations where people with low income live. 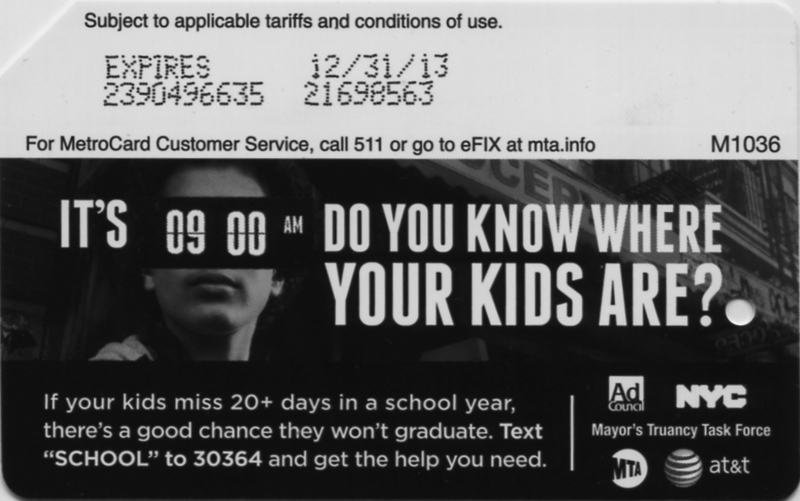 Bloomberg Administration put a lot of energy into reforming education system in New York. 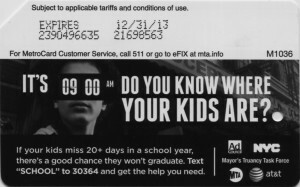 This metrocard promotes parent awareness about whereabouts of kids during school hours of the day. 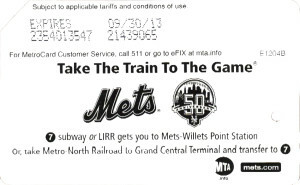 Once again MTA teams up with Mets to issue new version of the same theme to promote usage of public transportation to get to Mets games. This time also to commemorate 50th anniversary of Mets. 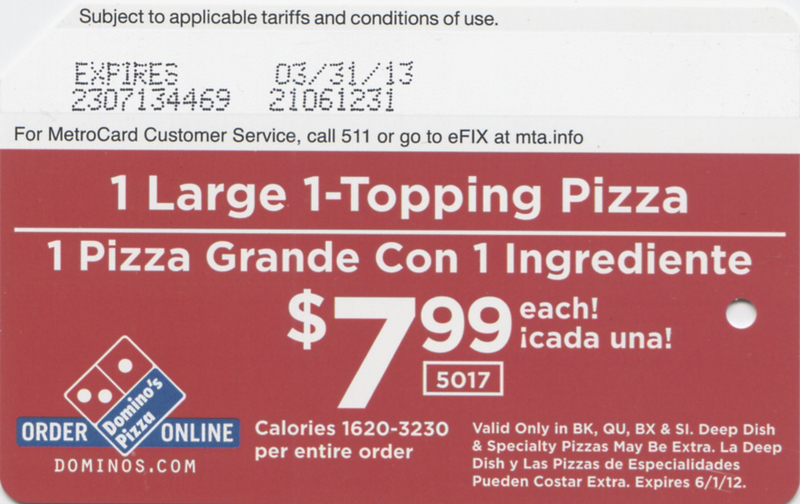 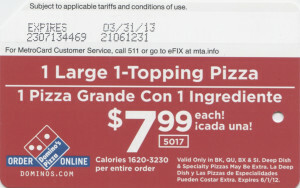 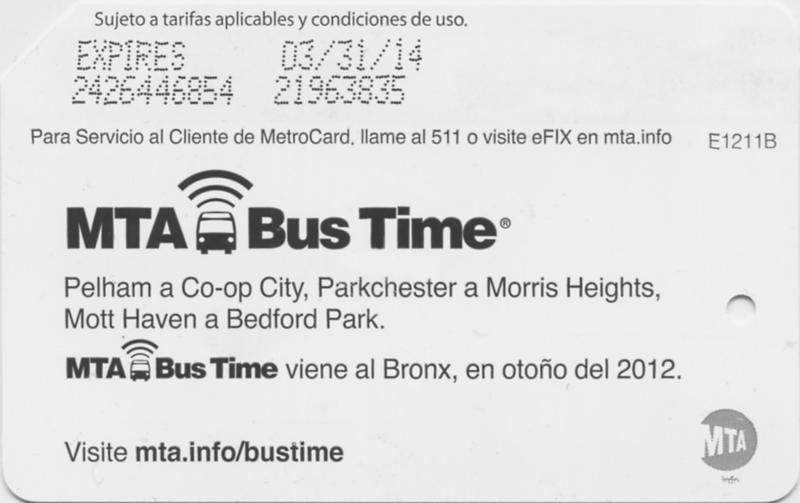 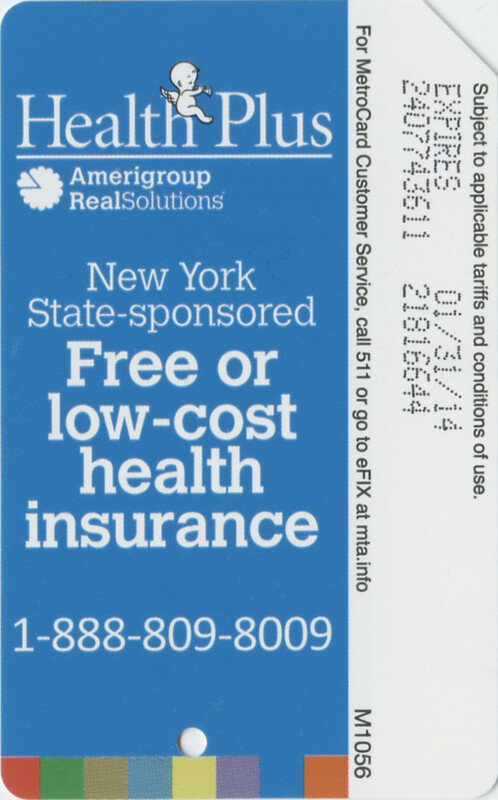 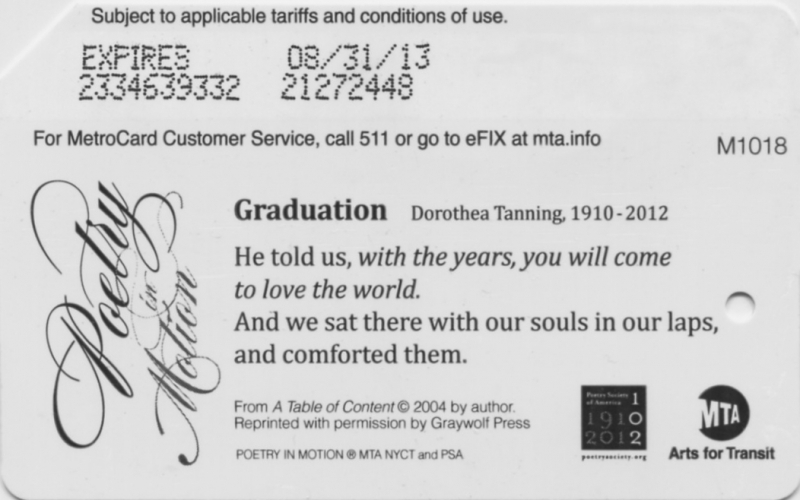 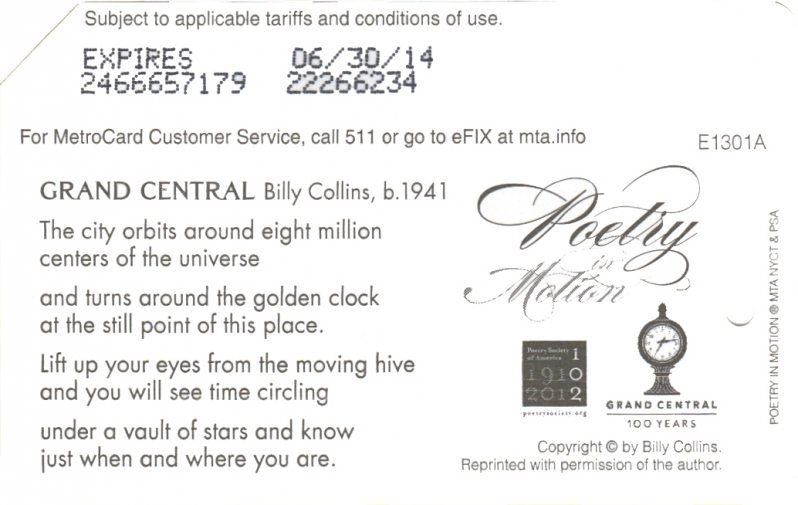 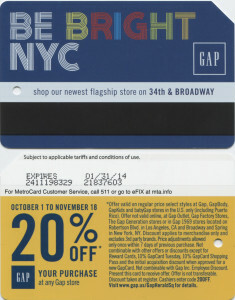 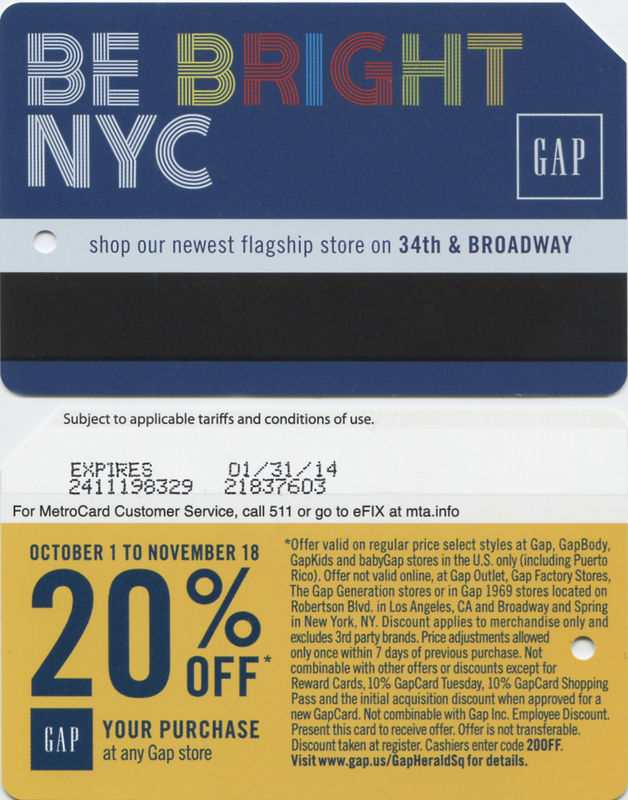 Metrocard with advertisement by Domino’s Pizza was distributed in outer boroughs: the Bronx, Brooklyn, Queens. 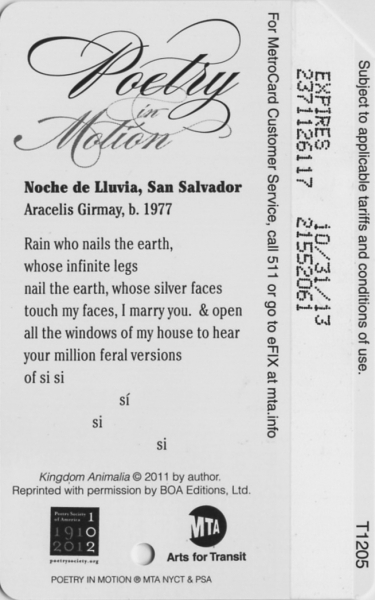 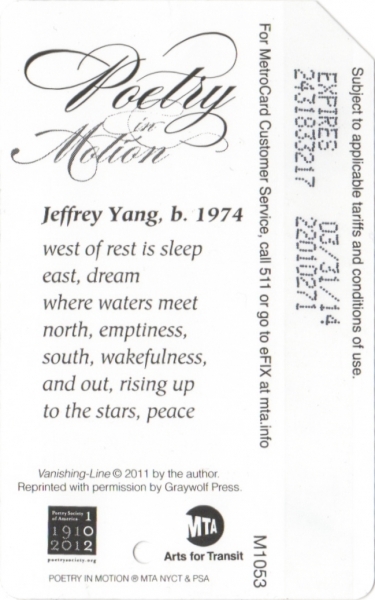 New series of Poetry in Motion started in 2012. 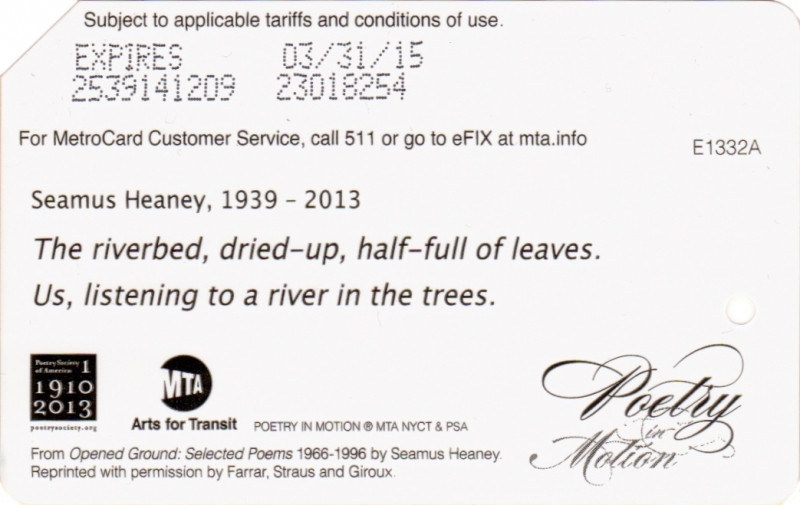 All cards have logo of Arts for Transit. 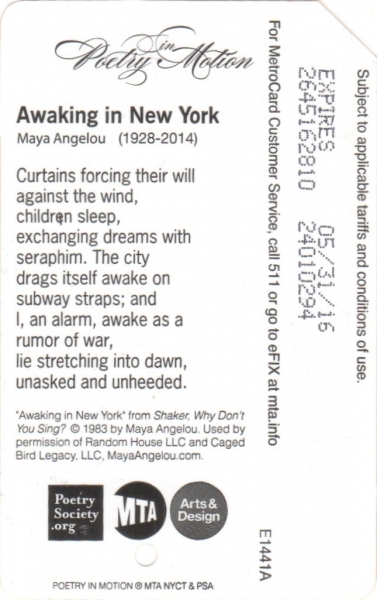 Those cards are reminder of posters with the same title sponsored by Barnes & Noble bookstore in the past.